In Great Britain, the ordnance (guns) and gunpowder came under the control of the Master General of the Ordnance through the Board of Ordnance which existed between 1597 and 1855. The Master General of the Ordnance had both a military role, as commander of the Artillery and the Engineers, and a civil role, as head of the Ordnance Department. On the civil side, the Board of Ordnance controlled stores, lands, geographical and geological survey, defensive works, barracks, military hospitals, factories and contracts. In 1855 the responsibility for the administration of ordnance passed to the Secretary of State for War by royal decree "revoking the letters patent of the Master General, Lieutenant-General and Principal Storekeeper of the Ordnance". The abolition of the Board of Ordnance was a response to its perceived failures during the Crimean war. As the Colony of New South Wales evolved during the 19th century, a distinction emerged between "Imperial" (British Government) stores and "Colonial" stores. Strictly speaking, the Board of Ordnance was only responsible for Imperial business but in practice arrangements sometimes overlapped, as when Richard Rogers held both the position of Ordnance Storekeeper and that of Colonial Storekeeper between 1839 and 1844. Both the Military/Ordnance Storekeeper and the Colonial Storekeeper had responsibility for portion of the guns and gunpowder. 1894: Responsibility split between Assistant Commissary-General of Ordnance (military explosives) and Superintendent Mercantile Explosives Department (commercial explosives). Until 1836 there was no branch of the Ordnance Department in New South Wales; the Commissariat kept a separate account of Ordnance stores received, issued and remaining. At least during the later 1820s and early 1830s the Brigade Major was responsible for the ordnance stores, whilst an Ordnance Serjeant (later Ordnance Sergeant) did the day to day work of running the powder magazine. 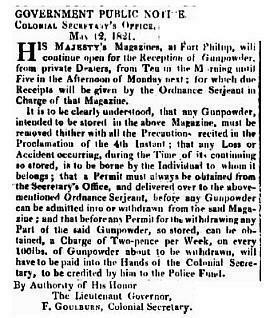 In a Government notice published in the Sydney Gazette and New South Wales Advertiser of 12 May 1821 and issued by the Colonial Secretary, are specified the conditions under which persons may lodge gunpowder at "His Majesty's Magazines", at Fort Phillip. This notice refers to the "Ordnance Serjeant". Prior to the arrival of Abner Brown (see below) in 1823, the responsibility for the magazines was allocated to a non-commissioned officer of the regiment then posted to the colony. This person was known as the Ordnance Serjeant. His Excellency the Governor and Commander of the Forces has been pleased to appoint Serjeant Hugh Barnes, of the 48th Regiment, to act as Ordnance and Artillery Serjeant at Sydney with a Salary of One Shilling and Sixpence per Day, commencing from the 1st of this present Month of September; and to be paid from the Police Fund. By Command of His Excellency, The Governor and Commander of the Forces, H.C. ANTILL, Major of Brigade." Barnes died, aged 33 years, on 17 June 1822 from unknown causes, just two weeks after the birth of a daughter, Selina, to his partner, Mary Steward. The Gazette of 25 November 1824 refers to a Serjeant Parish of the 48th Foot as having formerly been the Ordnance Serjeant. It's unclear whether he succeeded or preceded Hugh Barnes in the posting. "... the superintendence of the Batteries, Ordnance Stores, and Magazines; as likewise, of the Telegraph and Signal Establishments." That Your Memorialist had also the responsibility and considerable trouble in the storing and issuing of Gunpowder belonging to Merchants from which a revenue accrued to the Colony; all and every part of which services were quite foreign to, and unconnected with those duties which your Memorialist was appointed to perform..."
Colonel Snodgrass was rewarded with the sum of £1,000 for his services as Ordnance Storekeeper (Sydney Herald, 12 October 1838). It appears that Col. Snodgrass discharged his responsibility for the Magazines through Abner Brown from 1829 to 1836. It is interesting to find that Abner also appropriated the title of "Ordnance Storekeeper" when he could, as explained below. Abner Willerton Brown, Ordnance Sergeant, 1824? - 1835? Abner Brown arrived free in the Colony in 1823 on the "Jupiter". (Colonial Secretary's papers, NRS 898, Special Bundles 1794-1825, item 4/424, page 441). On 20 September 1824 he petitioned the Governor concerning his rations. In this petition he describes himself as "acting as a Military man at the Head of the Artillery Department and also of the Civil Branch of the Ordnance". (Colonial Secretary's papers, NRS 897, Main series of letters received, 1788-1825, item 4/1780, page 289. The reference to "acting as a Military man" suggests that he was a retired soldier. Brown's petition also demonstrates that he was recruited in England for service in the colony. The memorial of Abner Brown. In Charge of the Ordnance Department; Humbly Sheweth. That; In the early part of January 1823 Memorialist was then residing at Woolwich in Kent, and was sent for by an Officer of the Adjt Generals Department of the Royal Artillery, who informed memorialist that there was wanted, Three Overseers, and Twelve Sub Overseers, over Convicts, to go out to the Colony of New South Wales, and that Memorialist was told by the Deputy Adjt General of Artillery; if Memorialist would accept the offer, in consequence of his long services and particular (that of a Non Commissioned Officer) that Memorialist should have the first situation, he then told Memorialist that the three Overseers was to have a Salary of £ 60 and the Sub Overseers £ 30 per annum. Free House, Coals, Candles and Two Full Rations of all Species and of course Spirits included, which had not been the case. This agreement was signified to Memorialist, and made through the Channel of the Earl Bathurst to the Honble Board of Ordnance, and from the Honble Board of Ordnance to Lieut. General Sir John Macleod G.C.H - Deputy Adjt General of Royal Artillery - and on this agreement I accepted the Situation, and was appointed the Superintendent of the Party during our stay in England, the Passage out, and until further Orders. Memorialist not wishing to be the least troublesome to your Excellency, past? it on until this present period, in hopes that Memorialist's agreement with His Majesty's Government in LONDON would be fully complied with, without any further trouble. The Rations Memorialist has Received since the 29th November 1823 is as follows - One (indecipherable) and Flower for himself, Half a Ration for Wife and One Thirds Ration (indecipherable) child, Amounting in total to 15 3/4 pounds per week, with the exception of two Ration Days, where he only (indecipherable) nine pounds of Salt meat for the week, each time, and Saturday the 11th Instant, Memorialist received Nine pounds of Salt Meat Twelve and quarter pounds of Flower, and three and half pounds of Maize - and on Saturday the 18th Instant Received Fifteen and three Quarter pounds of Fresh Meat (indecipherable) and three quarter pounds of Flower, and Seven pounds of Maize the latter Article Memorialist cannot make use of for the support of his family. Memorialist (indecipherable) your Excellency that he is particularly sorry to have Occasion to trouble Your Excellency on the subject, but instead of his receiving his Two Full Rations as before stated, his Rations is decreasing very rapid, and every thing getting Dear, Memorialist Salary is inadequate to support his family. - and as Memorialist is Acting as a Military Man at the Head of the Artillery Department, as also of the Civil Branch of the Ordnance: Trusts that your Excellency will be pleased to Order, that Memorialist agreement with His Majesty's Government in LONDON may be fully complied with, - And your humble Memorialist will as in duty bound for ever Pray. His Excellency Sir Thomas Brisbane K.C.B." 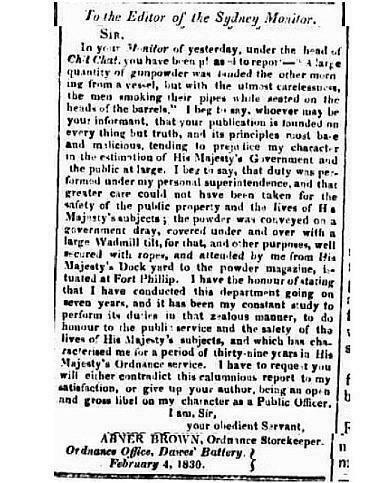 Brown wrote to the editor of The Sydney Monitor on 4 February 1830 defending himself against an allegation that he had allowed a shipment of gunpowder to be handled unsafely whilst in transit from the dockyard to Fort Phillip. His address is given as the Ordnance Office, Dawes' Battery, and his title as "Ordnance Storekeeper". Abner was occasionally noticed in the Sydney Gazette and NSW Advertiser. The issue of 30 November 1827 referred to him as the Ordnance Serjeant in a story on the reluctance of Sydney town's merchants to pay the magazine storage fees due to Brown even though he had reduced the amount from 3s. 4d. per ton per week to 1s. 8d. "In communicating the desire of the Public on this head, it falls in our way to notice a circumstance that is perhaps not generally known, though it has lately filled the north end of Sydney with perturbation. Thirty or forty barrels of gunpowder were landed the other day from a ship, and were deposited in an open yard for several days near the King's Wharf. But this is not all, about twenty or thirty barrels were landed within the last ten days at the King's Wharf. The boat, in which they were brought on shore, continued for some time alongside one of the Colonial crafts, which had a blazing fire on board, and sparks flying in all quarters. It was in the course of the day lodged on the Wharf, and a Gentleman happening to visit the spot on business, actually discovered a black native in the act of sitting upon a barrel, with a pipe in his mouth, from which the sable gentleman, unconscious of the danger to himself, his fellow creatures, the buildings and the ships, was leisurely puffing forth immense clouds." "A Military Court of Enquiry was held last week, to enquire into the particulars of a dispute which occurred the previous day, on board the floating powder magazine, between Mr. Brown, the Ordnance Storekeeper, and the guard on duty." The following anecdote about Abner Brown may not be factual, but it does say something about how Sydney-siders viewed him. It was published in Bell's Life in Sydney and Sporting Reviewer on 28 August 1847, described as an extract from "Sketches of the Colonial Bench and Bar". I have been unable to trace this publication, however internal evidence dates the event described to 1837, the year Sir James Dowling became Chief Justice, and the year before Abner departed the colony. It happened on an anniversary of this joyful event, that a gentleman with a jolly red face and a most important looking frame, and upon whose cranium the bump of self-esteem was fully developed, was summoned to attend upon the jury. On coming into Court, he rushed wildly up to the Bench on which the Chief was sitting and exclaimed in a most stentorian voice - "Your Honor! I can't sit upon the jury today." "Pray Sir," said the Chief mildly, "who are you?" "Me Sir! me: Why Sir, my name's Brown - Sir - yes Sir, Mr. Brown" "Oh! Mr. Brown - ah - very good - pray may I ask in what name you were christened?" "Yes, your Honor," replied the speaker in a most pompous manner, "my name is Abner Wellington Willerton Brown. I belong to the Ordnance Department; and the reason I cannot by any possibility attend as a juryman to-day is because - because - I am commanding officer in charge of Dawes's Battery, and deputed in virtue of my office, to fire a royal salute in honor of Her Majesty Victoria's birth-day, blessed be her name!" "Very good, replied Sir James, "I cannot sufficiently express my admiration of your excessive loyalty Mr. Abner Wellington Willerton Battery Brown, but this much I will say, that since you are this day about to perform the Can-on Law we will discharge you from Administering the Civil Law." Upon this judicial intimation Mr. Abner Wellington Willerton Brown bowed gracefully, and retired. It is almost unnecessary to remark that he bears the cognomen of "Battery Brown" to this hour." In 1828 occurred the first attempt to regulate the storage and carriage of explosives in the Colony of New South Wales; Governor Darling's Gunpowder Act. A Digression - the Story of "Battery Brown"
Given that Abner Brown's address in 1830 was Dawes' Battery, could he have been the person known as "Battery Brown" about whom the Editor of the Sydney Gazette and NSW Advertiser wrote on 15 May 1838? Like to know more about Battery Brown and his "delicate affair"? Do, Mr. Bombardier, thy business mind. Fill thy shells with ammunition of other kind. The Ordnance Storekeeper Immortalised in (Bad) Verse? "The Ordnance Department was given physical custody of the military works and buildings, the ordnance and other military stores, as well as the buildings occupied by the convicts and the stores and clothing required for the use of the convict establishment. The Ordnance Department also became responsible for keeping most of the records relating to custody and issue of all government non-perishable stores in NSW." On 1 January 1836 the Royal Engineer and Ordnance Storekeeper, who had arrived from Britain late in 1835, commenced duties. 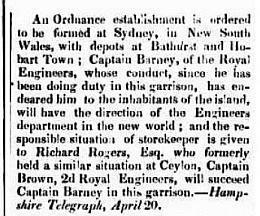 "On 12 December 1835, Captain G. Barney RE was appointed to assume all Ordnance responsibilities in the NSW Colony. He was assisted in this task by Storekeeper R. Rodgers, who was the Government Storekeeper at St George Barracks, Sydney Town." (John D. Tilbrook To The Warrior His Arms A History of the Ordnance Services in the Australian Army, Chapter 2, page 11). Richard Rogers arrived in Sydney by the barque British Sovereign on 11 December 1835, accompanied by Mrs Rogers and three children, Miss Rogers, Edward Rogers and Richard Rogers. Captain Barney and his family arrived by the same ship. Also on 1 January 1836, a number of establishments, including Dawes Battery, Fort Macquarie, Fort Phillip, Ordnance Store and the Goat Island magazine, were transferred from the Board of Works to the Board of Ordnance (The Sydney Gazette and New South Wales Advertiser, 30 June 1838). 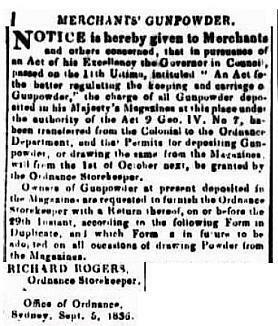 In 1836, a new Gunpowder Act was enacted, to replace that of 1828. "On 1 January 1836 the Royal Engineer and Ordnance Storekeeper, who had arrived from Britain late in 1835, commenced duties. In 1837 the British Treasury Commissioners concurred with suggestions by Bourke that the Colonial Stores be placed under Ordnance superintendence and instructions were conveyed to the Ordnance Storekeeper "to afford the co-operation and assistance required by the Colonial Government" in the matter of stores control. On 1 January 1839 the Ordnance Storekeeper took charge of the Colonial Store Department although Bourke pointed that "the Colonial Store Department is not abolished by this arrangement but only placed under the charge of an Ordnance Officer, as the Colonial Engineer Department was placed some time ago under the charge of the Commanding Royal Engineer. A separate Establishment of clerks and foremen is kept up for each of these Departments, in order that no increased expense may fall upon the Ordnance, it being on these terms alone that the Board of Ordnance would consent to the arrangement"." In 1844 Rogers resigned as Colonial Storekeeper (but not as Ordnance Storekeeper) over the issue of cuts to the staffing of the Colonial Storekeepers Department. His correspondence with the Colonial Secretary to this effect was published in the Sydney Morning Herald of 3 December 1844. In this correspondence, Rogers points out that the Board of Ordnance, when assenting to his undertaking the Colonial duties, made their agreement conditional on the arrangement not interfering with the business of the Ordnance Department. Presumably as a result of Roger's resignation, on 1 January 1845, the Colonial Storekeeper's Department was separated from Ordnance control. In 1849 a decision was taken by the British government to close the Office of Ordnance and transfer to the colonial government the barracks and all military buildings. In 1852, a committee was appointed by the Lords of the Treasury in Britain to enquire into the Naval, Ordnance and Commissariat establishments including those in New South Wales. Its report mentions the Commissariat Officer, Ordnance Storekeeper, Deputy Ordnance Storekeeper & Barrack Master, and the "Ordnance Civil Establishments". (Sydney Morning Herald, 4 December 1852, page 3). The report also reveals that, in addition to the management and clerks, there were employed a Foreman of Magazine, an Armourer and Foreman of Labourers, 2 Labourers and an Office-Keeper. Although published in 1852, the report is probably describing the situation before the closure of the Office of Ordnance in 1850. 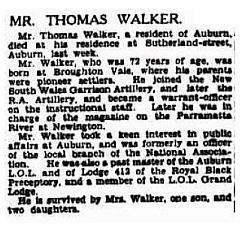 "Mr. Rogers, who has been so long Ordnance Storekeeper in Sydney, is under orders to proceed to Hobart Town, leaving the department here in charge of Mr. Percival Wilkinson, Deputy Ordnance Storekeeper." Richard Rogers remained in Australia, dying on 9 October 1863, aged 76, at his residence "Springfield" at Darling Point (Sydney Morning Herald, 12 October 1863). Percival Wilkinson came to Sydney from Portsmouth as deputy to Richard Rogers in 1837. In 1848 he is titled Assistant Military Storekeeper, in 1850 Deputy Ordnance Storekeeper and in 1857 Military Storekeeper. In August of 1862 he auctioned the contents of his residence at the Military-barrack Square, Paddington. In the advertisement for the sale, he named himself as "Ordnance Storekeeper and Barrack Master" and said that he was retiring from active service. "Mr. WEEKES moved the following vote, explaining that the excessive duties devolving upon the military storekeeper had rendered the services of a clerk necessary, and that owing to the very large amount of gunpowder now on Goat Island, the Government had been again compelled to have recourse to a floating magazine. Mr. DICKSON urged the advisability, if further accommodation was necessary, of having separate magazines, and recommended the establishment of magazines in different parts of the country. Mr. MORIARTY and Mr. SADLEIR concurred in thinking that nothing was more dangerous than having all the powder imported into the country stored in one magazine, not only on account of the fearful effects that would attend an explosion, but as when the powder was thus destroyed, we should be divested of our means of self-protection. The vote was agreed to." "The catalyst for the destruction of some Convict records in 1863 was a July 1862 memorandum by Percival Wilkinson of the Military Stores Office, Sydney, entitled "List of Articles in the Military Store, lodged on the breaking up of the Royal Engineer Department and the Convict Establishment …". This was referred to the Governor by the Secretary of State, the Duke of Newcastle, in a Despatch which was received in January 1863. While agreeing with Wilkinson that the "documents connected with Convicts should on no account be sold" and that they could properly be destroyed as there could be "no sufficient motive for preserving such masses of obsolete papers", Newcastle left the decision up to the Governor as to the method of disposal." " ... that they cannot, with equal confidence, acquit the Colonial Storekeeper of all knowledge of the practices of his late Chief Clerk." John Buchanan was dismissed, and a partial reorganisation of his Department was undertaken, with responsibility for some stores being dispersed. Harbour and lighthouse stores, for example, became the responsibility of the Harbour Master. (Sydney Morning Herald, 14 June 1861). "... although everything is kept in good order, the space is altogether inadequate. The magazines are full, notwithstanding that the supply they contain would not extend beyond a very limited demand, and the Board did not fail to observe that packages containing gunpowder in tins occupied at least twice the space occupied by bulk gunpowder of equal weight." Presumably the Colonial Storekeeper had the use of the two "colonial" magazines, constructed in 1854 and 1859, whilst the Ordnance powder was kept in the "Ordnance", or "Queen's" magazine. "was abolished on 30 June 1864 by the Governor, with the advice of the Executive Council. At this time the staff of the Colonial Storekeeper consisted of the Colonial Storekeeper (J.B. Cole), the Chief Clerk (Lancelot Iredale Brennand), one clerk, two assistant clerks, one foreman, one assistant foreman, three labourers and one messenger." The Chief Clerk, Brennand, subsequently became the head of the Government Stores Department in the 1870s, with the title of Superintendent of Stores before retiring in about 1880. "It will be in the recollection of our readers that, during a portion of the past year, a Board sat, under appointment from the Colonial Treasurer (the Hon. James Watson) to inquire into the condition and working of the Colonial Stores Department...."
The NSW Civil Service List of 1885 also shows a number of staff listed under "Colonial Stores" in addition to those shown under "Ordnance", and when the Premier referred to the Colonial Storekeeper in the Legislative Assembly on 17 November 1898, in response to a question about the loan of marquees for lady's garden parties, it was probably just through force of habit. In January 1866 Cole wrote as the "Deputy Superintendent of Stores" of the "Military Store Office" in a letter written in response to a government directive to effect savings. He describes himself as being responsible for the Goat Island and Spectacle Island magazines, and the colonial military stores. One foreman to each magazine. The available evidence suggests, but does not confirm, that J.B. Cole was a clerk or ordnance storekeeper in the service of the Board of Ordnance prior to his appointment to the Sydney position. The Quebec Almanac of 1839 and the Montreal Pocket Almanack of 1844 both show that a J.B. Cole was a clerk in the Ordnance Department of the British Army at Montreal. 19 June 1866 - leaves Sydney for London on ship "Maid of Judah" with Mrs Cole, Misses Cole (3) and Master Cole. (Maitland Mercury and Hunter River General Advertiser of 23 June 1866. The timing of Cole's early departure, coming a month or two after he had responded to the Government's request to produce financial savings, suggests that he was disillusioned with his employment situation, and had resigned in consequence. The Sands Directories records that Alexander Paton was the Assistant Foreman of Magazines, Goat Island in 1863 and 1864 and Foreman of Magazines at Spectacle Island in 1867, 1868 and 1869. Paton was appointed as Superintendent of Colonial Military Stores and of the Gunpowder Magazine at Spectacle Island on 28 September 1869. On 28 December 1870 the role of Barrack Master was added. He was too ill to appear before the Storage of Gunpowder Board when called to give evidence on 22 June 1875 and died later in 1875 (NSW BDM 3601/1875).His widow's (Emma Jane Paton) death notice, published in the Sydney Morning Herald of 16 December 1901, describes him as "Alexander Sinclair Paton, of Edinburgh, Scotland, late head of the Ordnance Department, Sydney." The Sands Directory of 1868 also records that T. J. Blanchard was the Clerk at Goat Island. Julien Blanchard was appointed Assistant Ordnance Storekeeper and Barrack Master in 1871. In 1871, after the removal of the British Army garrison, the NSW Government created the Ordnance and Barrack Department, with the Ordnance Storekeeper at its head. This Department was separate to the Government Stores Department. Also created was a Warlike Stores Board, which provided direction to the Ordnance and Barrack Department. The Department was now responsible for all military supplies and ammunition (torpedoes excluded) and for all matters concerning private (commercial) explosives. The formation of the Board was notified in the Gazette of 28 January 1870; amongst its members was Alexander Paton. Julien Blanchard was appointed as Secretary. The other members were Lieutenant-Colonel Richardson, the Officer Commanding the Volunteer Forces (President), Major Shepherd, Volunteer Artillery, Captain Hixson, Commandant of the Naval Brigade and Captain E. A. Moriarty, Volunteer Artillery. The resurrection of the title of Ordnance Storekeeper at this period may have something to do with the prestige attaching to it as a consequence of its long history. The title was given a legislative imprimatur in the 1876 Gunpowder and Explosive Consolidation Act. A new Gunpowder Act was enacted in 1876, replacing that of 1836. By 1876, Julien Thomas Blanchard was the Ordnance Storekeeper and Barrack Master, probably the last in that post, which appears to have become defunct between 1891 (when he was nominal defendant in a court case involving merchant's explosives) and 1894. References to the "Ordnance and Barrack Department" in the Sydney Morning Herald cease by 1893. In 1885 F. B. Thirkell was appointed acting Ordnance Storekeeper and Barrack Master, as well as a temporary member of the Warlike Stores Board during the absence of Blanchard with the Sudan Contingent. In 1899, Blanchard, as Lieutenant-Colonel, is noted as being the Ordnance Officer on the Headquarters staff at Victoria Barracks. In 1902, following Federation, he was compulsorily retired on grounds of age. "Major Julien Thomas Blanchard was born in Sydney, NSW on 18 September 1844. He was commissioned with the NSW Forces on 15 December 1862 and was appointed the Clerk of Goat Island Magazine. Promoted Assistant Ordnance Storekeeper and Barracks Master on 1 April 1871 and then Ordnance Storekeeper and Barracks Master on 20 July 1876. Blanchard served as the Paymaster and Commissariat Officer attached to the NSW Sudan Contingent Headquarters in 1885. He was promoted Major on 1 August 1888 and became Assistant Commissary General of Ordnance on 20 February 1891. He became a member of the Ordnance Store Corps on its formation in July 1895. Blanchard was granted the honorary rank of Lieutenant Colonel on 1 July 1897 and retained command as the Assistant Commissary General of Ordnance. He retired as a Lieutenant Colonel on 1 September 1902. Colonel Blanchard died 1913." Blanchard never married; in retirement he lived at Bondi and took up lawn bowls. His death was reported in the Sydney Morning Herald of 6 August 1913. His decorations, including the Egypt Medal 1882-1889, Khedive's Star and Mayor of Sydney Soudan Medal are lodged with the Australian War Memorial. "The committee in their progress report of the 25th March invited the attention of the Royal Commission to the Ordnance Store Department, and are unanimous in recommending its re-organization. At present this department is in no way under the control of the military authorities. In fact, if, in time of war, a deficient supply of munitions of war were found to exist, the Commandant could not be held in the slightest degree responsible, inasmuch as the committee find that supplies are drawn from store without due provision being made for their being replaced. Further, that officer is not furnished with the periodical returns which are absolutely necessary to enable him to recommend to the Government the replacement of warlike stores used for reviews, ordinary military training, &c.
These recommendations seems not to have been implemented, insofar as the Ordnance and Barrack Department continued on for another decade or so. However it sheds an interesting light on Julien Blanchard's decision to volunteer for the Sudan Contingent in 1885. In 1888, the Colonial Secretary approved instructions for the guidance of the Officer Commanding Military Forces, Ordnance Storekeeper and Barrack Master; these were published as NSW Military Forces General Order G.O.112 of 29 June 1888) (NSW Military Forces - Brigade and General Orders from 1878 to 30th June 1898, p. 212-214). These instructions placed the Ordnance Storekeeper under the direction of the Officer Commanding Military Forces "In all matters connected with suplies of munitions of war, military stores and equipment ..."
In 1892 a Royal Commission was appointed to investigate and reorganise the military forces. Blanchard gave evidence to this Commission in his military role of Assistant Commissary General of Artillery. It is likely that this Commission was the trigger, either directly or indirectly, for the demise of the Ordnance and Barrack Department. This outcome had been foreshadowed by the 1881 Royal Commission. The Mercantile Explosive Department - (Consisting of the Public Magazines) to be under the control of the Colonial Treasurer - to take effect, respectively, from the 1st instant ..."
"Assistant Commissary-General of Ordnance in charge. Staff. - Deputy Assistant Commissary-General of Ordnance, 1 receiver and issuer of stores, 2 clerks, 1 supernumerary clerk. Armoury Branch. - 1 warrant officer superintending clerk (in charge), 1 chief armourer sergeant, 1 assistant armourer sergeant, 3 labourers, 3 supernumerary labourers. Ordnance Store Branch. - 1 saddler, 4 labourers, 2 supernumerary labourers. Goat Island Magazine. - 1 laboratory officer, 1 labourer, 1 watchman. Middle Harbour Magazine. - 1 caretaker, 1 watchman. ..."
The Mercantile Explosives Department was formed within the Treasury Department to manage the mercantile explosives formerly the responsibility of the Ordnance Storekeeper. This was eventually to evolve, in 1902, into the Explosives Department. In 1922 this Department transferred to the Department of Mines. It managed the explosives hulks in Middle Harbour, and later the Bantry Bay magazines. "Ordnance Store Corps: "C" (Ordnance) Branch of the Military Secretary's Department, now a civil branch, to be converted into an Ordnance Store Corps." "The Corps comprised No 1 Gun Wharf Section with a Deputy Assistant Commissary General of Ordnance, a Lieutenant and Quartermaster, three Conductors of Stores and one Sergeant Artificer. No 2 Magazine Section was composed of one Conductor of Stores and three Privates; and No 3 Armourer's Section was composed of a Lieutenant and Quartermaster, with one Armourer Sergeant and two Privates. These appointments were filled by members of the permanent military forces." "...On 15 September 1902 the following Warrant Officer, Non-Commissioned Officers and Gunners were attached to the newly formed No 4 Company pending transfer to the Ordnance Stores Corps....The following N.C.O. and men employed at the Newington Magazine were attached to No. 2 Company also pending transfer to the Ordnance Stores Corps. Gunners G. Jennings, T. Campbell and W, Clarke..."
Sydney Morning Herald, 1 February 1932. For the first time, there was a clear split between the authority responsible for commercial explosives, and that responsible for the military explosives. Julien Thomas Blanchard was a person who straddled the divide, becoming a member of the Ordnance Store Corps on its foundation. As Ordnance Storekeeper, he was a public servant, but he simultaneously held rank as a part-timer in the NSW Military Forces. The terms "Ordnance Store", "Commissariat Store", and "Ordnance Yard" seem to have been used rather loosely during the 19th century, but all relate to a site on the western side of Sydney Cove, adjacent to the King's (later Queen's) Wharf. Later the locality would be called the western side of Circular Quay. 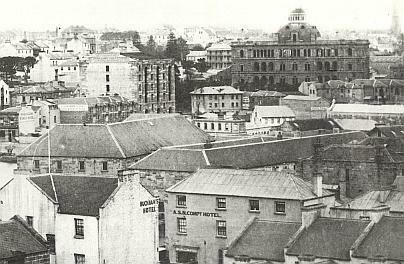 A better photograph of the Commissariat and Ordnance Stores in the 1870s can be found at the State Library of NSW. In this photo, the Commissariat Store is the large building closest to the water; the Ordnance Store is immediately in front of it. There is some evidence in this photo that the Ordnance Store was extended horizontally at some stage. The 1836 plan reproduced below shows the Ordnance Store on an alignment that is not quite parallel with the Commissariat Store and about half its length. By 1854, a map (Woolcott & Clarke's Map Of The City Of Sydney 1854) shows the Ordnance Store on the same alignment but now a little longer than the Commissariat Store. By 1868, Government Stores had been erected immediately north of the Commissariat Store on the old dockyard site; later maps (1888, 1895) show additional infill structures. Mentions of a Military Store(s) Office in the Sydney Morning Herald commence in February 1858 and cease in 1869. The first reference, in the issue of 25 February 1858, is to "Military Store Office (late Ordnance)", so it is presumed to be the Ordnance Store, renamed to reflect the change in title from Ordnance to Military Storekeeper. Other mentions place the Store at "George-street north"; "foot of George-street"; "lower George-street". The Ordnance Store is one of the buildings transferred to the Board of Ordnance from the Board of Works on 1 January 1836. It appears that at some stage the Ordnance Department also inherited the Commissariat Store. In 1855, the Colonial Government was keen for it to be shared with the Colonial Storekeeper, but it was not until 1859 that conversion work was undertaken to enable this sharing. It seems that the Ordnance Storekeeper was not happy to share the store without physical barriers in place - this reinforces other hints that the Colonial Storekeeper's inventory records were inferior to those kept by the Ordnance. By mid-1861, the Colonial stores that had previously been lodged in private storehouses, at considerable rental expense, had been removed to a portion of the Commissariat Store. Map Showing Location of Commissariat Store in a Map Published in 1836. (Extracted from Plan Of Sydney With Pyrmont 1836 @ http://mapco.net/sydney1836/sydney.htm). Image courtesy of MAPCO : Map And Plan Collection Online. "The removal of the Military Stores from the Old Ordnance Stores at the Circular Quay to the buildings formerly belonging to the A. S. N. Co. is now rapidly progressing under the supervision of Major Blanchard, but the great weight of some of the stores, such as guns and gun fittings, &c. renders the process of removal necessarily rather a slow one. The stores have recently been added to by the arrival of another 6in. gun and a quantity of gun fittings per the Cambrian Princess. The offices of the Ordnance Store and Barrack Department remain for the present in the old buildings, but Major Blanchard hopes soon to secure their removal to the A. S. N. buildings, where they would be in close proximity to the stores." 1. Thanks to Jennifer Bell for information on Hugh Barnes.